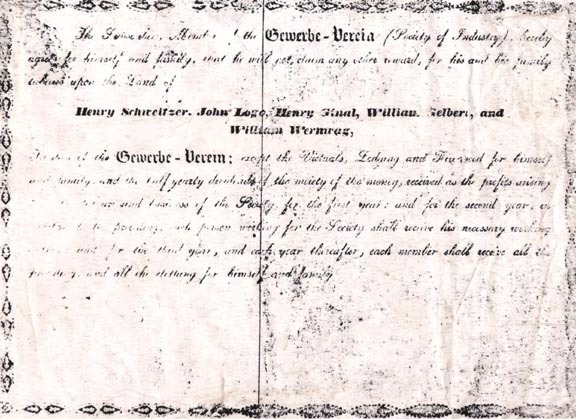 All the right, title and interest of Henry Schweitzer, John Logo, Henry Ginal, William Wernwag and William Gilbert, as Trustees of society of Industry in McKean County Pennsylvania. (Known as the German Society of Industry.) To or in the following described parcels of land, lying and being in the township of Sergeant, McKean county, and sate of Pennsylvania to win. Warrant number two thousand, eight hundred and eighty, unimproved, containing one hundred and ninety acres ALSO number two thousand, six hundred and sixty six, with fifty acres improved, and forty acres chopped, seven log houses, ore blacksmith shop and one steam saw mill, and containing one hundred and ninety acres; ALSO number two thousand five hundred and thirty-four, unimproved, containing nine hundred and ninety avers; ALSO number two thousand six hundred and twenty-four, unimproved, containing nine hundred acres; ALSO number two thousand six hundred and one, unimproved, containing nine hundred acres; ALSO number two thousand, six hundred and three, unimproved, containing nine hundred acres; ALSO number two thousand six hundred and two, improved, containing nine hundred acres, seventy-one cleared; ALSO number two thousand, six hundred and sixty-nine, containing nine hundred and sixty-nine, containing nine hundred acres, improved, one hundred acres cleared, twenty acres chopped, forty-two log houses, one log school house, one black smith shop, one shoe shop, one slaughter house, one bake hose, two log stables, one large frame barn, one tanner, one brick yard, one pottery, one ashery, three hundred and sixty eight young fruit trees, and two coal loads; ALSO warrant numbers two thousand, nine hundred and thirty four -two thousand, three hundred and eleven- two thousand three hundred and twelve- and two thousand three hundred and thirteen, unimproved, containing nine hundred acres and one hundred and thirteen, unimproved, containing nine hundred acres and one hundred and forty-eight perches each. (The above warrants are subject to the following deductions, on account of sales therefore made, and not conveyed to the said John Logo, Henry Ginal. William Wernwag, and William Gilbert, as trustees, to wit. The town of Instanter, lot number four containing nine acres and twenty-seven perches; number two containing fifty perches; number three containing two acres and thirty-one perches; number five containing thirteen acres and eighty-two perches; ALSO lot number sixteen, seventeen, eighteen, twenty, containing ninety acres; ALSO on the west side of North Street, number sixteen, containing one hundred acres; and on the west side of North Street, a lot released by B. B. Cooper to Joseph Mcilvain, lying between lots number fifteen and sixteen, containing one hundred and eighty-six acres, said lots, in the town and district, amounting together to seven hundred and sixty-one acres and thirty perches; ALSO excepting the undivided moity or half part of all those lots in the district of Instanter, and numbered ad described as follows to wit; Adjoining the said centre line on the east side thereof number fifteen containing fifty aches. Numbers twenty-one, twenty-two, twenty-three, twenty-four, twenty-five, twenty-six, and twenty-seven, containing each ninety acres. Number twenty-eight containing eighty-one acres, and adjoining the town of Instanter and the last mentioned lot on the east part of number two containing one hundred acres. Number three, four, five, six, seven, and eight, containing two hundred acres. Number nine, containing two hundred and eleven acres and fifty-two perches. And adjoining the last mentioned lots on the east, and being the east tier of lots in said district; Lot number eleven, containing seventy-eight acres and one hundred and thirty-two perches. Lots number twelve, thirteen, fourteen, fifteen, sixteen, and seventeen, containing each one hundred and fifty seven acres and one hundred and four perches. Number eighteen, containing each one hundred and fifty seven aches and one hundred four perches. Number eighteen, containing one hundred and sixty-six acres, and eighty-nine hundredths of an acre. Thirty-one lots in the town of Instanter east of said centre line containing three hundred and eighty-four acres and seventy hundredths of an acre. And in said town of Instanter lots formerly intended for public uses, Numbers four and five, containing four acres and fifty-four perches. And the two public squares at the centre of said town of Instanter east of the north and centre line aforesaid, containing twenty acre.—The entire lots last above mentioned containing and amounting together to three thousand eight hundred and seventy two acres and ninety-seven perches. But the above mentioned and excepted moiety, being half that amount to wit: one thousand, nine hundred, and thirty-six acres and forty-eight and a half perches will be together with the foregoing lots of which the entirety is excepted reduce the amount hereby levied upon of the above warrants to ten thousand, three hundred, and fifty-six acres and thirty-four perches. Warrants number two thousand, three hundred, and seventy-five, unimproved, containing nine hundred and ninety acres. ALSO, Two thousand, four hundred, and seventy, unimproved, containing nine hundred and ninety acres. ALSO, Number two thousand, five hundred and seventy three, containing nine hundred and ninety acres, improved, forty-eight acres cleared, two log houses and one school house. ALSO, Number two thousand six hundred and seventy-seven, containing nine hundred, and ninety acres, improved, fourteen acres cleared, one frame house. ALSO, Number two thousand, three hundred, and eighty, unimproved containing nine hundred and ninety acres. ALSO, Number two thousand five hundred and fifty-six, containing nine hundred and ninety acres, improved. ALSO, Number two thousand, five hundred, and fifty-six, containing nine hundred and ninety acre, improved forty-two acres cleared, three log houses. ALSO, Number two thousand, six hundred, and sixty-four, containing nine hundred and ninety acres, improved, seven acres cleared, one log house. ALSO, Number two thousand three hundred sixty-five, containing nine hundred and ninety acres, improved, fourteen acres cleared, twelve young fruit trees and two log houses. ALSO, Warrants numbered as follows, in the township of sergeant in McKean county, and State of Pennsylvania, to wit. Numbers two thousand five hundred. Two thousand and ninety-five. Two thousand five hundred and thirteen. Two thousand five hundred and four. Two thousand three hundred and thirty-one. Tow thousand three hundred and forty-five. Two thousand seven hundred and thirty-one. Two thousand seven hundred and twenty-nine. Two thousand seven hundred twenty-three. Two thousand six hundred and ninety-five. Two thousand six hundred and ninety-three. Two thousand six hundred and eighty-five. Two thousand six hundred and eighty-four. Two thousand six hundred seventy-six. And two thousand six hundred and seventy-five containing each nine hundred and ninety acres. ALSO, Fifty-four acres of land in Instanter district, bounded as follows, beginning at a large beech tree, letter C., standing in the line which extends eastward along the north boundary of the town plat of Instanter, and one hundred and thirty chains from the centre of North street, being the south east corner of land heretofore conveyed by Orin W. Ogden to Benjamin B. Cooper, thence north fifty chains and fourteen links, thence south fifty to the north boundary of lots in the district of Instanter, thence east ten chains and ten links to the place of beginning, containing in the whole thirty two thousand four hundred and forty-six acres and one hundred perches, after deducting the ports above excepted. The above lands are leveled on mud to be sold subject to a subsisting mortgage thereon, dated the fourteenth day of May, one thousand eight hundred and forty-two, given by Henry Schweitzer, Henry Ginal, John Logo, William Wernwag and William Gilbert to Charles C. Gaskill, for twenty five thousand four hundred and sixteen dollars and twenty five cents. Said mortgage is recorded in McKean county, and was given to secure the purchase money for said lands, and is payable by installments due of first of April, one thousand and forty-five; the first of April, one thousand eight hundred and forty-six; the first of April, one thousand eight hundred and forty-seven, and on the first of April, one thousand eight hundred and forty-eight, on interest from date. We the undersigned Henry Schweitzer, John Logo, Henry Ginal, Wm. Gelbert, and Wm. 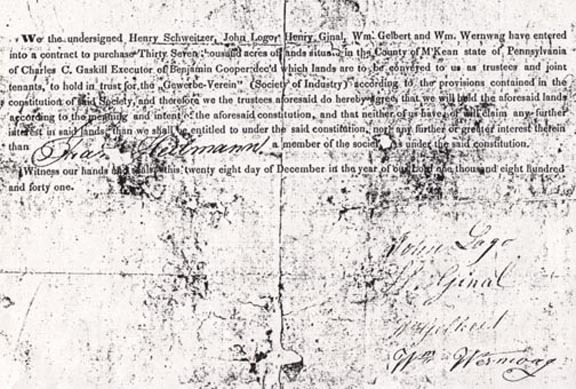 Wernwag have entered into a contract to purchase Thirty Seven thousand acres of lands situated in the County of McKean state of Pennsylvania of Charles C. Gaskill Executor of Benjamin Cooper dec'd which lands are to be conveyed to us as trustees and joint tenants, to hold in trust for the "Gewerbe-Verein" (Society of Industry) according to the provisions contained in the constitution of said Society, and therefore we the trustees aforesaid do hereby agree, that we will hold the aforesaid lands according to the meaning and intent of the aforesaid constitution, and that neither of us have, or will claim any further interest in said lands, than we shall be entitled to under the said constitution, nor any further or greater interest therein than Frances Heitmann a member of the society as under the said constitution. Witness our hands and seals, this twenty eight day of December in the year of our Lord one thousand eight hundred and forty one. “We, the undersigned William Gilbert, Henry Schweitzer, Henry Ginal and William Wernwag, have entered into a contract to purchase thirty-seven thousand acres of land, situate in the Country of McKean, State of Pennsylvania, of Charles C. Gaskel, Executor of Benjamin Cooper, deceased, which lands are to be conveyed to us as trustees and joint tenants, to hold in trust for the Society of Industry, we, the trustees, aforesaid, do hereby agree that we will hold the aforesaid lands according to the meaning and intent of the constitution, and that neither of us have or will claim any further interest in said lands than we shall be entitled to under the constitution, nor any further or greater interest than---------------, a member of the Society has under the constitution. Witness our hands and seals this twenty-eighth day of December, in the year of our Lord, one thousand eight hundred and forty-one.” Signed by Henry Schweitzer, Henry Ginal, John Logo, William Gilbert and William Wernwag. The completion of the land purchase agreement of December 8th, 1841, for the legal transfer of title, took place on May 14, 1842 by a deed of mortgage of Charles C. Gaskill and Ralph U. M. Cooper, acting executors of the Estate of Benjamin B. Cooper to Henry Schweitzer, Henry Ginal, John Logo, William Wernwag and William Gilbert, in trust for the Society of Industry. This document was recorded in the office of Recorder of Deeds for McKean County March 31st, 1843. The number of acres involved was thirty-two thousand four hundred forty-sic and the consideration price was thirty-eight thousand nine hundred fifty-one dollars and eighty-two cents. This amount is the unpaid balance due to the Cooper Estate and is represented by a series of notes, payable in installments signed by the five Trustees and are secured by the Deed of Mortgage above mentioned approximately twelve thousand acres involved in the transaction were in the Instanter District and the balance is in the Stanton District of Hamlin Township near the Marvin Creek valley. “But, he can sell or give away his certificate to any person of the same age and station, if it can be proven that the said person is of good character and standing and worthy of becoming a member. The owner of this certificate may not sell it as long as a member of his family remains in the colony.” Signed by John Logo, Treasurer, August 25, 1842, Philadelphia, Pa. The Society was started on the plan and by the enterprise of Henry Ginall of Philadelphia. It was founded on the principal of community of property, with the exception of money and furniture. It was to be sustained by the cooperation of its members. An equal distribution of profits was to be made semi-annually. The stock was divided into six hundred and sixty shares, and was sold for one hundred dollars each. An individual could become a member by purchasing a share of stock, going on the ground and doing his share of the work. Married women were not obliged to work for the community, but were to devote their attention to the care of their families. Children, when grown up, become members by conforming to the rules of the Society. Agriculture and the raising of cattle were the prominent objects of the Society, but manufactories were established. The members of each trade chose their own inspector and determined the amount of work which should be done by each individual or company of persons. Marriage was encouraged and each family resided in its separate house. Single persons were furnished a lodging and took their meals in the community kitchen. Clothing of a plain and uniform kind, provision, fuel, medicines and other necessities were regularly distributed by rations from the common stores. All religions were tolerated. Whenever three hundred share holders voted to maintain a minister, they could do so. The minister would have to buy a share and then would be entitled to a house and support in return for his spiritual labors. The large area of land purchased was to be divided into sections, in the center of each a town was to be established. The first village planned was named Teutonia and was located in the District of Instanter. It was situated in the southern part of Warrant No. 2669 and was adjacent to the eight hundred acre plot of the Town of Instanter promoted by Benjamin B. Cooper in 1817. All unsold lots within the Town of Instanter plan were included in the sale of the large area to the Society of Industry. In the center of the area selected for the location of the village, a parcel of land was set aside for general public purposes. It was a longitudinal plot, and a street, called Main Street was run through lengthwise dividing it into two equal sections; the upper part was reserved for a church and a school and in its extreme southern end, the erection of a hotel was planned. Along the fringe of the northern side of the community plot, a street called Broadway was laid out, along which a row of houses were built of logs, one and one-half stories high, of uniform design and plan, one room on the first floor and a loft under the roof; a short distance beyond the dwellings, was the general repair shop, the pottery works and the brick plant. This area was known as the North Hill. The lower section of the public square, bordering on the lower line of Main Street was the site of the warehouse, the general store, the office, the cabinet maker’s shop, the boarding house for single women, and the location of the community kitchen. A lodging house for single men was established in the extreme southern part of the plot. A short distance west of the warehouse, outside of the community plot, was the location of the storage cellar. A street was also opened along the south border line of the south half of the public ground, along which a row of dwellings had been erected. The residents of the village had the choice of two routes when going to Clermont, one being by way of North Street from the center of the Instanter Town plot designated on the survey map of Benjamin B. Cooper in 1817. The major part of the land of the Instanter Town District was included in the sale by the Cooper Estate to the Society of Industry; the other route was known as the Five Mile road which approached Clermont village at the overhead bridge of the Shawmut Railroad. At the time the railroad was built it followed the Five Mile road route for a distance of several miles on its way to Clermont. Immediately south of the village, was the area referred to as the South Hill and on its slope was located the farm, including the large barn reported to be the biggest one in the county; here this vegetable garden, the gardener’s house and a storage cellar were also situated, as well as the site of the tannery. Among those plying their trades in the community were a weaver, a tailor, a dressmaker, a shoe maker, a baker, a watch maker and cabinet maker; this list should include the farmers, the workers in the pottery works, the brick manufacturing plant, the tannery, the building construction crew and the wood choppers who are continually engaged in clearing the land. At first the prospects of the colony were so promising that the shares rose in value from one hundred dollars to two hundred and fifty dollars. Quick progress was made by the industry of the workers, but markets were so distant and transportation so difficult that profits were small. The soil was very productive and large quantities of all kinds of vegetables were raised in abundance. The potato crop of 1843 amounted to three thousand bushels. From available records of the village we learned that farmers charged a dollar a day for the labor of a man and a horse; that wheat was sold at a dollar and a half a bushel; that white flour was bought at Four Dollars and fifty cents a barrel, and corn meal at One Dollar and twenty-five cents a barrel. Forty-six Dollars were paid for a pair of oxen; Ten Dollars for three calves; Ninety Dollars for a flock of fifty sheep and two and one-half cents a pound for beef cattle. August 9, 1843- Ginalsburg seeds four men to begin making a road that should be finished before winter. Received of O. Hamlin of Smethport two fat steers for $35.00. 14 lbs. Sole Leather at $0.28- $3.92. of several days for the purpose of studying the industries and plan of our colony. September 2, 1843- Mr. Gindel asked for cloth for a pair of trousers. The one pair he has is badly worn. At present there is no cloth in stock. Mr. Gindel must wait until next week. Another agreement dated November 29, 1841, signed by C. C. Gaskell, Executor of the estate of B. B. Cooper, and also signed by William Wernwag, Dr. Ginal, John Logan, W. Gilbert and Attorney Henry Schweitzer, Trustees of the German Industrial Society, was delivered to us today. September 5, 1843- Mr. White has a threshing machine which we may have in fourteen days at the rate of one dollar for man and horse and one bushel for each one hundred bushels of grain threshed for the use of the machine. Gideon Irons has a machine which threshes 150 to 200 bushels per day. His rates are two dollars a day for one man and two horses and a charge of five bushels of grain per one hundred for use of machine. A meeting of the officers of the German Industrial Society will be held at Ginalsburg tonight. Purchased from Roland Burdick of Potato Creek road, one pair of oxen for $46.00. September 12, 1843- In payment of his bill, Mr. Hall wants 3 bushels of wheat at $1.50 and balance in cash. September 13, 1843- Mr. Buehl wants a stove and wood as soon as possible. Mr. Wolfe moved here today from Ginalsburg. He needs a stove. The milliner, Madam Schmidt, handed in at the office for collection a bill of $0.75 for a ladies’ hat, purchased by Sylvester Young of Potato Creek Road. September 17, 1843- General Diller of Philadelphia, the agent for our Society came today with Mr. William P. Wilcox. He was greatly pleased with the progress we are making and encouraged us to continue. Messrs. Sartwell, Bennet and Richmond and their wives came from Smethport today to visit our colony. September 18, 1843- Sold to Mr. Witte $42.75 worth of leather. September 27, 1843- Ransom Burdick of Potato Creek Road has cattle for sale. The best that’s in our land. Nor on a better plan. I am sure she’ll take the county. Is the bride of all the county. September 29, 1843- Hellman brought a load of apples from Bunker Hill. October 3, 1843- Received a wagon land of applies from Bunker Hill. 50 bu. Lentils at $0.69 1/2 a Bushel. Fresh Rutabagas at $0.20 a Bushel. October 5, 1843- P.B. Richmond demands $25.00 on his $60.00 which is three weeks over dur. October 8, 1843- Drafts have been sent to Baltimore and Philadelphia. October 11, 1843- Today occurred the death of Emeline, the youngest child of Mr. Meyer. October 13, 1843- Mr. White came today to thresh our grain. He demands two bushel per 100 instead of one bushel. October 14, 1843- John King requests five month’s credit on his bill. Bread was delivered to Ginalsburg this morning. Mrs. Catherine paid $250 for a share of our stock. Bought of K. Compton, 2 pr. Oxen for $90.00 each. October 19, 1843- We are notified by Constable Beckwith to appear before Squire Easterbrook at one o’ clock on Saturday for a hearing on a charge made by Ransom Beckwith. November 3, 1843- H. Burlingame of Smethport will sell his fatted cattle at $0.2 1/2 a lb. November 6, 1843- Our draft for $200 sent to Baltimore was not accepted. Medburg will finish carding the wool next week. November 10, 1843- Miller and Hass went to Smethport today to inspect the cattle offered by Corwin and Smith at $0.2 1/2 a pound. November 20, 1843- Community assembly tonight. The second village to be established in accordance with the general plan was Ginalsburg, two miles west of Clermont, on Instanter Creek. The location was at Woodvale, a former railroad station of the abandoned Johnsonburg and Clermont Railroad. A number of log houses, a barn and a large steam powered saw mill had been erected. The community did not exist beyond the early stages of development. A partial list of surnames of the residents of Teutonia and Ginalsburg is as follows: Herzog; Steinbauer; bayer; H eitman; J. Martin; A. Martin; Roeder; Heinman; Leidenstiker; Decker; Nuhs; Miller; Boehler; Kilmer; Heilman; Ribecker; Gindel; Buehl; Wolfe; Walters; Schmidt; Meyer; Haas; and Hafner. In the early months of 1844, there were indications that the future of the Teutonia project was becoming a matter of serious doubt in the minds of many Society members. The organization was controlled by a group of five trustees, at least four of whom were classed in the category of absentee landlords. The trustees apparently did not inform the membership of the details of the land purchase agreement, especially of that portion pertaining to the amount of the unpaid balance of the purchase price of thirty-eight thousand nine hundred fifty-one dollars, secured by a mortgage payable in principle installments plus interest. The membership was not likewise informed of the amount of compensation for the trustees in their capacity as such. The residents of Teutonia were immigrants from Germany, where living conditions were difficult by reason of the economic, political and religious turmoil existing generally at that time throughout Europe. When they came to this country, they did not know what the living conditions and customs were over here, but they concluded that any change they would face would be a betterment. The management and operational procedures lacked leadership authority resulting in miscalculation of income and expenditures frequently resulting in scarcity of cash funds. In view of the nature of the operation of the organization it was probably impossible to remedy this condition. Another source of rising discontent was the equal distribution of supplies and provisions to all the members, including those who failed to do their share of the work in the categories in which the Society was involved. It may also be assumed that at least some of the members of the colony became disconcerted over the realization that they have surrendered their opportunity of being the architect of their lives and of becoming self sustaining, free and independent citizens. They compared their status as members of the Society of Teutonia requiring the wearing of clothes of a uniform kind and style and the living in houses of similar design and construction, with a single large room on the first floor and a limited area loft under the roof. A comparison of their habitation with the homes they observed throughout the surrounding district did not tend to develop any satisfaction or contentment. The general atmosphere in the community seemed to be corroding and the members being aware of this situation, requested of Henry Ginal the opportunity of examining the deal and other documents pertaining to the establishment of the colony. Ginal then feigned an important business trip to Olean, from which he failed to return. The next year he turned up in Milwaukee with the Freethinker Society. The town of Teutonia thereupon completely collapsed and was abandoned, its people scattered to other areas and reestablished their homes and became self sustaining, free and independent citizens. Warrant No. 2666- Ginalsburg- improved 50 acres, chopped 40 acres, seven log houses, blacksmith shop, barn and one steam saw mill; Warrant No. 2602- seventy-one acres cleared; Warrant No. 2669- improved 100 acres, 20 acres chopped, 42 log houses, one log school house, one blacksmith shop, one shoe shop, one slaughter house, one bake house, two log stables, one large frame barn, one tannery, one brick yard, one pottery, one ashery, 368 young fruit trees and two coal beds. This Warrant was the nucleus of the town of Teutonia. Warrant No. 2573- forty-eight acres cleared, two log houses and one school house; Warrant No. 2677- fourteen acres cleared and one frame barn; Warrant No. 2556- forty-two acres cleared, three log houses; Warrant No. 2664- seven acres cleared, one log house; Warrant No. 2365- fourteen acres cleared, two log houses and twelve young fruit trees. The last five numbered warrants were located in Hamlin Township. After the Cooper Estate had regained title to the properties purchased, they offered sixty acres to each individual who wished to stay and clear the land. Those who took advantage of the offer, and became permanent settlers were Michael Bayer, Francis Heitman, John Martin, Adam Martin, Philip Roeder and John Steinbauer. The only other member who remained nearby was William Heineman, the shoe maker, who bought a farm at Hamlin. Carlson of Clermont and Mrs.
V. A. Kraft of Ridgeway, Pa.
"In 1841(sic) covered wagons carried a colony of Germans from Philadelphia over the New York to Olean Road. Their destination was SE McKean County. The road, particularly after leaving Olean, was rough and the journey was long, but the company was enthusiastic for they held high hopes for a prosperous settlement. True to their German training, they had their work carefully planned. Each family had contributed $50 (sic--$100) to furnish the capital needed for the new enterprise". "Teutonia dates back to March 1843, when the Society of Industry (Henry Ginal,agent) established the town four miles west of Ginalsburg (sic--one mile SE of Ginalsburg). The principles of this society varied a little from the older Fourier system. The capital was $40,000, the acreage 40,000,including the coal hills. In the year named there were 450 inhabitants, a school-building and 70 or 80 log dwellings. This community divided their purchase into several districts, in each of which a town was projected. Clothing and food were distributed from the commercial store, married women were not compelled to work for the community, and all religious forms were tolerated. At Ginalsburg there were then 100 inhabitants. A stone school-house, a steam saw mill, a pottery and a furnace were projected. The dwellings were frame buildings. In 1875, when Mr. John Forrest went to Clermont as paymaster for the Buffalo Coal Company, there were remains of the houses. It was a communal affair, which, like most of that class, fell to pieces. Ginalsburg is also a town of the past." "On December 10, 1845(sic---1843) a large band of German immigrants from Philadelphia began building a town in Sertgeant Township near what is today's village of Clermont. The plan was 'communistic' in type, 'owning all things together'., and the active governing body worked on that idea, share and share alike. Some 400 German families made the trek, from 1837 on through the years. They cleared a large amount of land and built their town which they named "Teutonia". The site had substantially-built log houses and regularly laid-out streets. It had a markethouse, a community store, and all such buildings as necessary for industrial establishments as carried out under their community government system. In 1846, some mebbers became disgruntled with the system, and began to leave the area; and a great many families moved westward. Remaining settlers mad eregular claims for the land, and began making individual farms in the valley, later working in the coal mining industry nearby.The name ":Teutonia" gradually fell intodisuse, and ":Bunker Hill was predominate for a long tome until it too was changed in 1875 to the name still used today, Clermont"ed note: Bunker Hill preceded Teutonia by app 20 years, and was two miles east northeast of Teutonia. "Your note mentions German colonies in the area. Dad told me that the early name of Clermont was Teutonia and he once pointed out to me some old stone foundations of the early settlers' houses about a half mile out the old Shawmut railroad grade toward St Marys --on the left hand side. I was always under the impression that this was the site of Teutonia." "Several dozen colonies were planted between 1842 and 1845, and nearly all were killed in the sprout. Other experiments in Western New York and in the mountains of Northern Pennsylvania had the same land mania, debt and title problems, and quarrels, and broke up usually after the first summer." "Fourierist colonies sprang up in other parts of the US; 33 of them have been counted, but there were certainly many more than that. It must be owned that of these 33, a large number did not last even a year; they were fires of straw, extinguished almost as soon as ther were lighted." "With notable exceptions, like Brook Farm, most earlier communities had chosen sites west of Central New York and Pennsylvania, and East of the Mississippi. These newly-opened regions provided inexpensive, readily available land." "When they dissolved, it was become some individual or individuals among them grew avaricious and disrupted the oganization, or because the young people resented the discipline and restriction necessary to that way of life. They did not fail because they were communistic. The reverse was the case. They succeeded in building up more prosperous groups than those founded by the individualistic, 'devil-take-the-hindmost' settlers, and many of their communities were shining examples of efficiency, thrift, and sound economic planning." A little known episode in the history of McKean County is related in the Warren County Almanac for 1942. It is the story of Teutonia—May 13, 1817, Benjamin B. Cooper and Joseph McIlvaine, of New Jersey, laid out on paper the town of Instanter to be the center of a large development on their McKean county lands. Their model was the city of Washington. On May 14, 1842, their representatives sold 32,446 acres, 100 perches in sergeant Township, including part of the town site, to the trustees for “Gewerbe Verein” a German “Society for Industry” led by Henry Ginal of Philadelphia, for $38,951.82 part of which was represented by a mortgage for 425,416.25. In the next two years 450 families moved in…houses, school houses, a church, blacksmith shop, tannery, sawmills, pottery, shoe shop, slaughter house, ashery—all were built and hundreds of fruit trees were set out…property, except furniture and clothing, was held in common; and the whole community worked like beavers making such progress as was most uncommon in settlements of this sort…but they had over-reached themselves. When the mortgage balance of only $2,083.25 fell due, they could not meet it on the day. The mortgage promptly foreclosed and on May 27, 1845, got the sheriff’s deed for everything…many of their descendants still live in that vicinity. 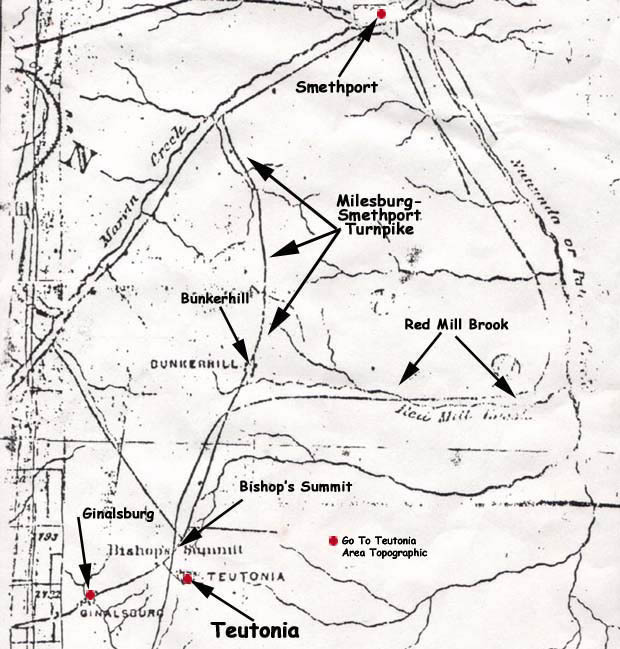 Teutonia was about five miles below Smethport, between the present towns of Clermont and Instanter---which is not on the side of the site of the Instanter laid out in 1817—Emporium Press-Independent. "Sand Pumpings" column in the Bradford Era on Wednesday, said: "Rose Herzog of Smethport takes exception to our labeling as Communists the people who settled Teutonia (near Smethport) back in the 1840's. The dictionary defines communists as "the doctrine of having property in common," as history records the Teutonians as definitely owning property in common. Although many of us today think of Communism only as appiled to Russians, we had no intention of suggesting that this old time McKean County settlement was a slave state, complete with secret police, purges, and revolutionists. As Mrs. Herzog points out, many early societies (such aas the Puritians, the Shakers, and the Oneida Community) held property in common and were therefore communists in the exact sense of the term. "Mrs. Herzog sent us much information about Teutonia, and names of some of its settlers--Steinhauers, Heitmans, Martins, Bayers, Walters, Roeders, and Heinnemans--names that today are associated with the building of McKean County. Mrs. Herzog located the settlement as being of Clermont and says that many pieces of furniture made in Teutonia are still in existence in this area." The history of Teutonia, a communal settlement near Clermont, McKean County, was presented by Merle E. Dickinson, register of wills and clerk of the orphans court of McKean County, during a meeting of the Smethport Travelers Club in the Harris class Room of the Smethport Methodist Church last Saturday. The form of organization of Teutonia was actually communism long before the Russian type was placed in operation. All sources of production were owned by the community and each adult male was contributed his share of work. In return, he was received his share of the profits. Mr. Dickinson stated that McKean County was organized in 1804 during the presidency of Thomas Jefferson, and that there were only 142 persons McKean County in 1810. He mentioned that in 1821 some new families from New England and southwestern Pennsylvania took up residence in the county. “In 1840,” he said, “a group of people of German descent from the Philadelphia region organized calling themselves “The Society of Industry” and named their settlement Teutonia.” Mr. Dickinson stated that it is not certain how long Teutonia survived, but it could not have been more than seven or eight years. He mentioned that some of the families remained, and their descendants still live in McKean County. He listed descendants with family names such as Bayer, Roeder, Silfies, Martin, Amend, Heinemann, Herzog, Swarts and Hoffman. Mr. Dickinson said there is a deed on record in the McKean County Court House for 29 warrants of land containing 26,000 acres of land at a purchase price of $26,000. About $40,000 was realized from the sale of stock to purchase the land. Settlers of this ear, the speaker pointed out, seemed to prefer the higher ground. They did a tremendous job clearing the land and erecting buildings, including sawmills, a grist mil and a school. Their visions were of utopia in al their efforts. The settlers were Catholics and Lutherans, but strangely no church was ever built at Teutonia. It is estimated than 70 or more log houses were erected and 40 or 50 men were kept busy cutting trees for timber. There were several settlements, Mr. Dickinson recalled. He said the Bunker Hill settlement is worth of special mention. In the early days there was little market for timber because of lack of transportation facilities. The age of huge lumber rafts on the rivers was to come later. In order to clear land for planting crops, several hundreds acres of timber at Bunker Hill near Clermont, were cleared. The felled trees were left on the ground for a year or more and then set on fire. It was a terrible conflagration. The roar of the fire could be heard for miles and much of the embers were carried high into the air by the man-created furnace. It is possible that settlers thought the ashes would fertilize the soil. But such was not the case. The topsoil was burned to the extent that Bunker Hill remained barren until about 35 years ago, when nature started its own reforestation. A gristmill was built on Red Mill Brook, which originated at Clermont and flows into Potato Creek. The remains of the earth dam still visible. Last summer the three millstones were brought to Smethport for preservation by the McKean County historical Society. The millstones are 54 inches in diameter and 10 1⁄2 inch round hole in the center o each stone. “We do know,” Mr. Dickinson said, “that these good people came to McKean County with high ideals and a dream of success. They decided on the community venture as a means of owning land, raising the families and securing their future.